Endless ads and health campaigns over the years couldn’t place more emphasis on the hazardous impact of smoking on people’s health. 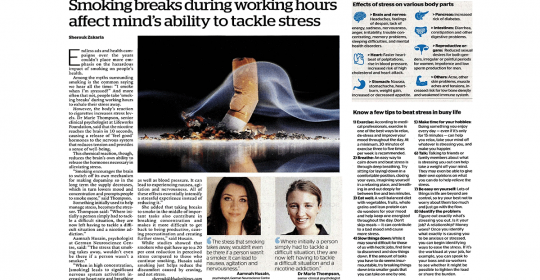 Among the myths surrounding smoking is the common saying we hear all the time: “I smoke when I’m stressed!” And more often than not, people take ‘smoking breaks’ during working hours to exhale their stress away. She added that taking breaks to smoke in the middle of important tasks also contribute in breaking concentration and makes it more difficult to get back to being productive, causing procrastination and creating further stress,” said Husain. While studies showed that smokers who quit have up to a 20 per cent reduction in perceived stress compared to those who continue smoking, Husain said smoking just helps reduce the discomfort caused by craving, and not stress. Working Long Hours Linked to Greater Risk for Stroke People working long hours have a 33 % greater risk of stroke! How increased workloads affect teachers, students Does homework affect mental wellbeing? Dear Migraine patients: STOP SMOKING! You may have a 3-fold increased stroke risk Multiple Sclerosis: What’s the real reason why you should stop smoking?